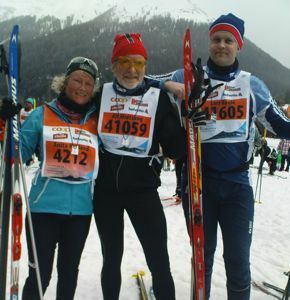 The valley of Engadin hosted once again an easy marathon and good atmosphere. Engadin is a nice place to be a tourist for the days leading up to race day. Lots of skitracks groomed every day and you can test the marathon track anytime. 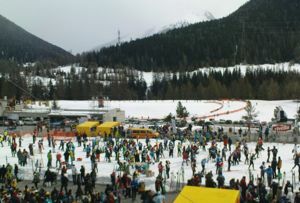 Apart from skiing there are also many other touristic things to do in Engadin so everytime I go there is something new. The racestart is done with five start times spreading out the twelve thousand skiers and avoiding the big congestions some other big races have in the start. On race day temperatures where milder than normal. At race start I registered only -2C making the waitingtime a lot warmer than last time. It had not been snowing for days but on race morning it fell down making the first 15km soft. Midway in race it got windy but that turned into comfortable wind in the back when we left Pontresina. Around Samedan snowfall had been little and tracks were harder giving some extra speed including wind in the back pushing us. Just before finish area temps were a few plus degrees and softer snow. Ok for skaters. For those doing classic skiing some started off fine with violet wax and ended up with some soft klisterwax in the end if you wanted grip. The best waxing for classic looked like being zero-ski or “rubbed-ski” as they are called. Organizers did an excellent job as always. Logistics from all parts of valley were fine to start – and later from finish back to hotel. The “Olympic-village” is a nice place to visit before race day and the Worldloppet meeting on Saturday is a good place to meet others that like to travel far to worldloppet races. Next time you come too?